Looking for things to do in Myrtle Beach for the whole family? Grab your friends and come to the Ocean Watersports in Myrtle Beach. Banana Boat Rides are a great thing to do with your friends and family while on vacation in Myrtle Beach. Zoom across the postcard waters of the Grand Strand and experience the thrill of hurdling over the waves on an inflatable banana boat ride in Myrtle Beach. It’s the ultimate way to cool off after enjoying some time in the sun and a safe adventure for the entire family. At Ocean Watersports, you’ll notice colorful banana boats splashing through the surf from behind many of the best resorts, hotels and condos. Located next to Family Kingdom Amusement Park, is where you can find Myrtle Beach Water Sports. Or just follow the laughter coming from the water as our riders bounce behind the uniquely-shaped toys. Hop on right from shore and hang on for a fun and scenic ride. Enjoy the views of shore and under the water. 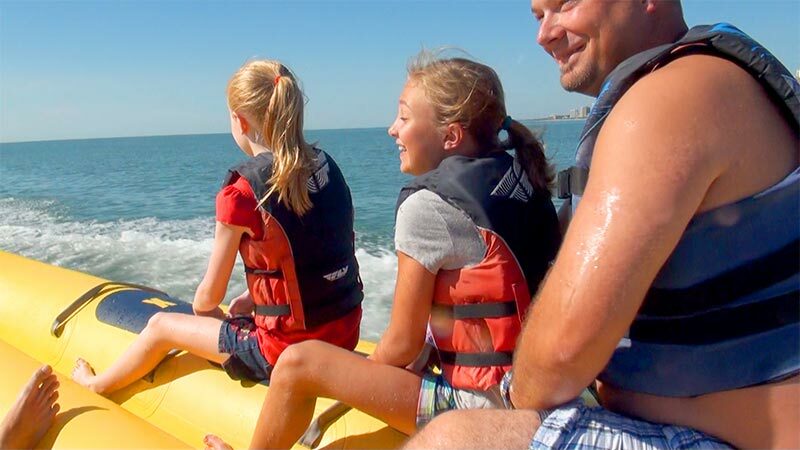 The banana boat rides are safe and crewed by an experienced and professional staff. Reservations can be made by calling 843-445-7777. On the beach at 3rd Ave South in Myrtle Beach. Park at 404 3rd Ave South, 29577, and walk out on the beach to see us. Call 843.445.7777 or click Here for directions.